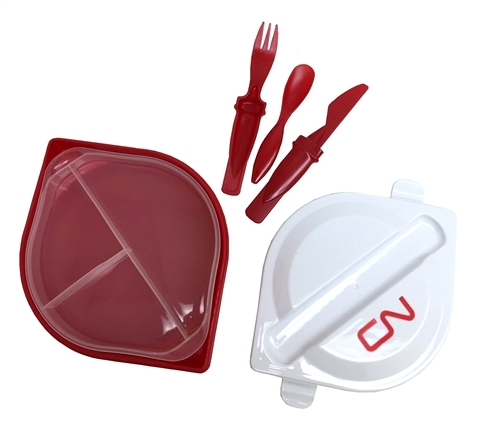 All in one lunch container with a three-piece cutlery set that fits in the top of the lid. Includes fork, spoon and serrated knife which stores inside a protective carrying case. Snap-lock lid. Separate sectional tray with 3 compartments. ABS cutlery and PP plastic case fit into top lid for storage. Featuring the CN logo on the lid. FDA compliant. 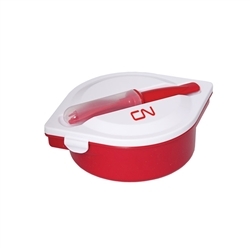 Container is Microwavable and dishwasher safe.